Myrtle Beach Safari | T.I.G.E.R.S. Preserve and the Rare Species Fund in support of outstanding wildlife conservation initiatives. T.I.G.E.R.S. Preserve and the Rare Species Fund in support of outstanding wildlife conservation initiatives. T.I.G.E.R.S. 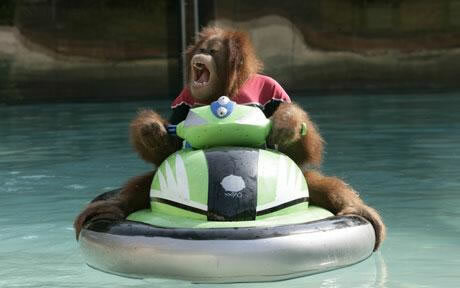 – Orangutan rides a jetski! Good Friday afternoon from T.I.G.E.R.S.! Visit this Wildlife Preserve just minutes from Myrtle Beach; check this out! Four-year-old rescued orangutan Surya is having a whale of a time playing on an inflatable jet ski at the TIGERS Preserve. 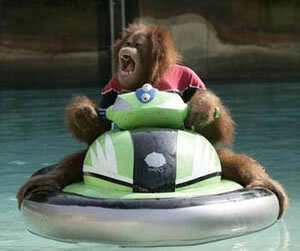 Surya a 4-year-old Orangutan rides an inflatable Jet Ski. The animal, dressed in a child’s wetsuit to keep it warm, enjoys floating across the wide pool, before waving at onlookers. Surya lives at The Institute of Greatly Endangered and Rare Species in Miami, Florida, USA. He is put in the pool every week to keep him active and challenged and appears to enjoy splashing about with his trainers. Animal expert Dr Bhagavan Antle said: “Suyra loves playing in the water. But he doesn’t like getting his head wet, so he wears a lifejacket so he doesn’t go underneath. Dr Antle and his team of handlers introduced Surya and other orangutans to water when they were just babies and played in a large bath. 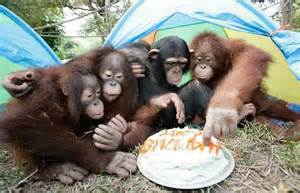 “The orangutans love playing in the bath. But they don’t swim naturally and so if you introduce them to the pool, they’d sink to the bottom,” he said. “So we discovered wearing children’s lifejackets helps to give them confidence. Now some of them can even swim without their life jackets. “But Surya prefers the jet ski and he’ll always head for it as soon as we get into the pool.” – Originally published by http://www.telegraph.co.uk. To learn more about animal and human interaction, visit our website. Better yet, make plans to come and visit us at T.I.G.E.R.S. next spring in Myrtle Beach. T.I.G.E.R.S. – Get within inches from live tigers FREE! Good Friday afternoon from T.I.G.E.R.S. in Myrtle Beach! T.I.G.E.R.S. 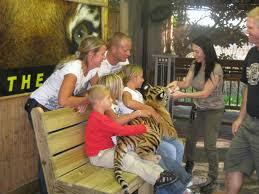 Preservation Station at Barefoot Landing in North Myrtle Beach is a free living tiger exhibit. 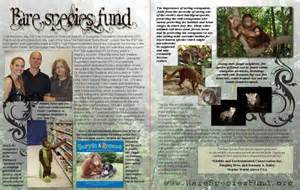 It is the fund raising effort for the conservation projects of the Rare Species Fund. Here is your chance to see the World’s Rarest Tigers, up-close and for FREE in the exhibit. This is the opportunity of a lifetime. Come visit T.I.G.E.R.S. Preservation Station and see these animals playing and relaxing in an outdoor environment. You will see standard Bengal tigers, Royal White Bengal tigers, and the rarest tiger in the world, the Golden Tabby tiger. At T.I.G.E.R.S. Preservation Station you can get nose to nose with 500 pound adult tigers. View these beautiful creatures with only glass between you and them, look right into their eyes! 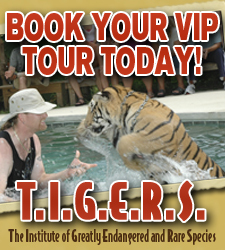 You will have the opportunity to interact with tiger cubs, apes, and more! Don’t miss the excitement! All proceeds go directly to support international wildlife conservation projects through the Rare Species Fund, and to the care and maintenance of our animal ambassadors. Good Afternoon! Our T.I.G.E.R.S. season begins in only three months and we know this is the time of year where families across the nation plan their vacations and weekend getaways. Opening just in time for Spring Break, the 2016 season at Myrtle Beach Safari is in our eleventh year providing once-in-a-lifetime interactive experiences! We also want to let you know about the hundreds of other reasons you should choose Myrtle Beach as your travel destination in 2016. The VIP Wild Encounter Tour always contains a wide variety of exotic animal ambassadors that you will get to see and interact with. Cubs of various sizes, young apes, ligers and a whole assortment of others will be on display while visiting our Preserve located only minutes from Myrtle Beach. Over the last decade we have donated over 1 Million Dollars, as well as our time, effort and expertise, to grassroots conservation programs in Asia and Africa. You can become part of our International Conservation Programs by taking the Wild Encounters Tour. Good Friday afternoon from T.I.G.E.R.S. in Myrtle Beach! As the sun rises and the foliage parts, a new day of adventure will start as T.I.G.E.R.S. (The Institute of Greatly Endangered and Rare Species) opens a portal to the glorious world of human kinds lasting love of animals with their wildlife preservation, education and training programs. Read what others have said! T.I.G.E.R.S. receives its financing base through a percentage of revenues taken in by the generosity of donations from exhibit guests, and the general public. Good afternoon from T.I.G.E.R.S in Myrtle Beach! The tour has closed for the season but we all must remain mindful of the efforts of the program which provides wildlife education, organization, and dedication to promoting global conservation. Even though the Chinese Giant Salamander is widespread in China, it’s also highly fragmented, according to the IUCN Red List. Because of overexploitation for human consumption, the salamander has experienced a major population decline — over 80 percent over 3 generations. The salamander’s habitat has also been severely destroyed and degraded. Apart from being one of the rarest as alligators in the world, the Chinese alligator is also one of their most endangered with less than 150 fragmented individuals left in the wild. According to Crocodiles of the World, even though the alligators live in a special reserve, the reserve can’t replace the “[t]housands of hectares of former alligator habitat [that] have been converted into agricultural lands.” Locals also view them as a nuisance since they eat ducks and destroy irrigation channels, so there’s little to no local effort to conserve them. According to the IUCN Red List, some experts believe that the South China Tiger is already extinct in the wild. 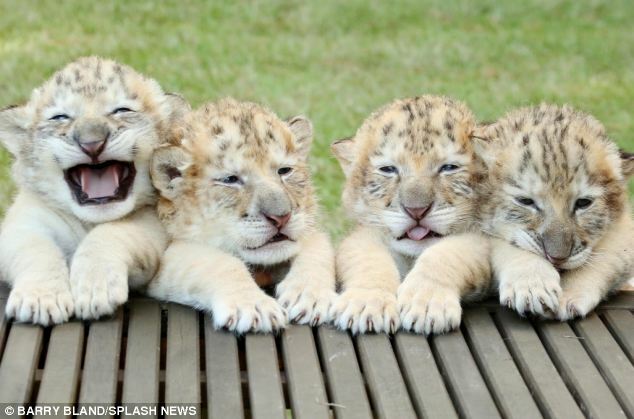 In the 1950s, there was an estimated 4,000 tigers. But a combination of “low prey density, widespread habitat degradation and fragmentation, and other human pressures” has brought us to the point of possible extinction. Sadly, no official or biologist has physically seen a tiger since the early 1970s. 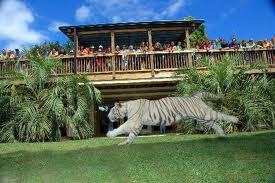 T.I.G.E.R.S is the only place in the world where you get to meet the Liger, the world’s largest cat as seen in the 2006 and 2014 Guiness Book of World Records! T.I.G.E.R.S – Read the Rolling Stone interview here! Good morning from T.I.G.E.R.S in Myrtle Beach! Even though T.I.G.E.R.S. is closed for the season, we still like to keep you informed about issues and topics about the animal world. Have you read the interview featured in Rolling Stone just a few weeks ago? Enjoy this sample! Antle told me that about 10 percent of T.I.G.E.R.S.’ annual revenue goes to a nonprofit called the Rare Species Fund, which supports conservation projects around the world. In 2013, the most recent year that financial reports are available, the Fund reportedly spent $78,370 on “wildlife conservation.” ……..
After watching Bubbles stroll down Antle’s street toward her usual Wednesday bath, I accept an invitation to swim with the elephant. 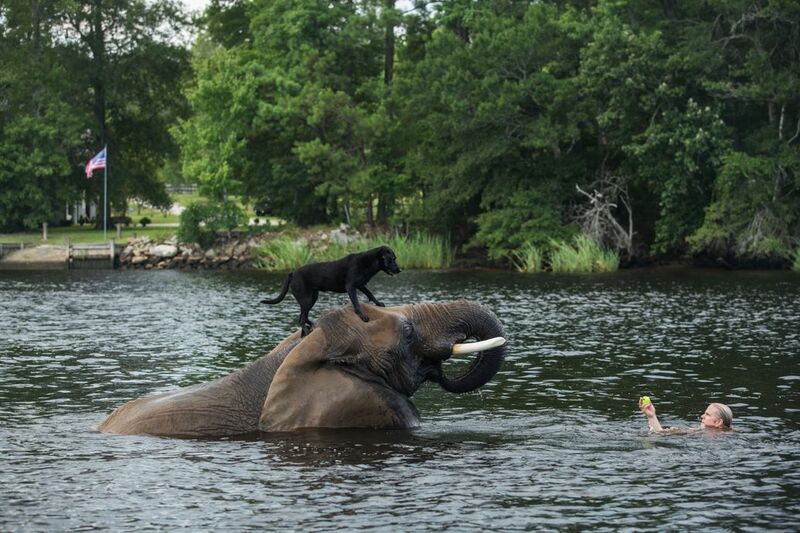 As soon as I hit the water, Bubbles runs her trunk between my legs and hoists me into the air. In a second, I’m on her head. Then I’m on her back, feet in the water, astounded. Her hide feels like living asphalt; her ears – satiny on the insides – slap against my skin. Maybe this is a trained behavior. But I think I can feel Bubbles’ curiosity, her intelligence, her irreverence; I start to understand her playfulness. Hello animal lovers, even though T.I.G.E.R.S. is closed for the season, we still like to keep you informed about issues and topics about the animal world. 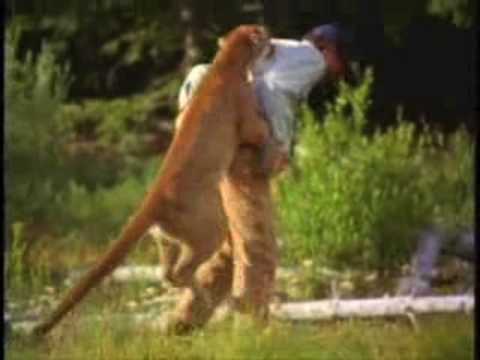 Everyone has heard that if you encounter a bear in the wild that you should freeze and play dead, but, what should you do if you have a face-to-face meeting with a mountain lion, does the same strategy still work? The answer might surprise you. As humans have migrated out of the urban areas and into the suburbs, and now rural areas, encounters with wild animals are becoming common. 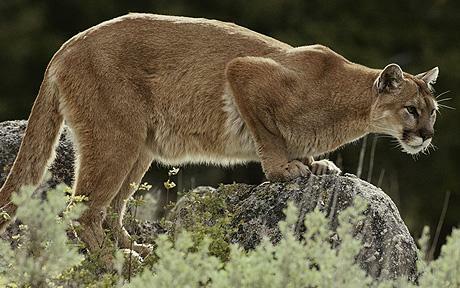 No doubt you’ve heard the stories or have seen the video on television or Youtube of deer sprinting through residential neighborhoods, or bears foraging through trash cans outside homes, but now, reports of mountain lions attacking humans is becoming more and more common. So, just what should you do if you should be out jogging on a wooded trail or hiking in the foothills and happen to meet up with a mountain lion? According to Richard Cross, a professor at the University of California, Davis and an expert on such things, evidence suggests that freezing might cause the cat to think that you’re helpless and cause it to attack. After studying 185 attacks during the 20th century, it appears that the best strategy is to slowly move away. Of the people who ran, half escaped injury but a higher percentage of those who ran died from injuries when the lion caught them. Ultimately, avoidance is the best strategy, but if you are in a mountainous area, staying alert, making noise and being aware of your surroundings is the best bet. T.I.G.E.R.S. – Here at T.I.G.E.R.S. all’s well. Good afternoon from T.I.G.E.R.S. in Myrtle Beach! It’s been just days after unprecedented rainfall and flooding affected our area and the rest of the state of South Carolina. On this beautiful 82 ° sunny Friday, the Grand Strand is open and ready for visitors. Check out this drone footage from the Preserve! The Wild Encounters Tour is a guided walk through a fifty acre preserve, just 17 miles South of Barefoot Landing, where you’ll meet tigers, wolves, leopards, chimpanzees, orangutans, and other endangered species, many of them up-close and un-caged! Here at T.I.G.E.R.S. all’s well. You have 3 more days to visit us before the end of this season; Oct 17, Oct 24, & Oct 31 2015. In case you didn’t make it, be sure to make your reservation for the 2016 season HERE! Good afternoon from T.I.G.E.R.S. in Myrtle Beach! We hope you all had a great week! 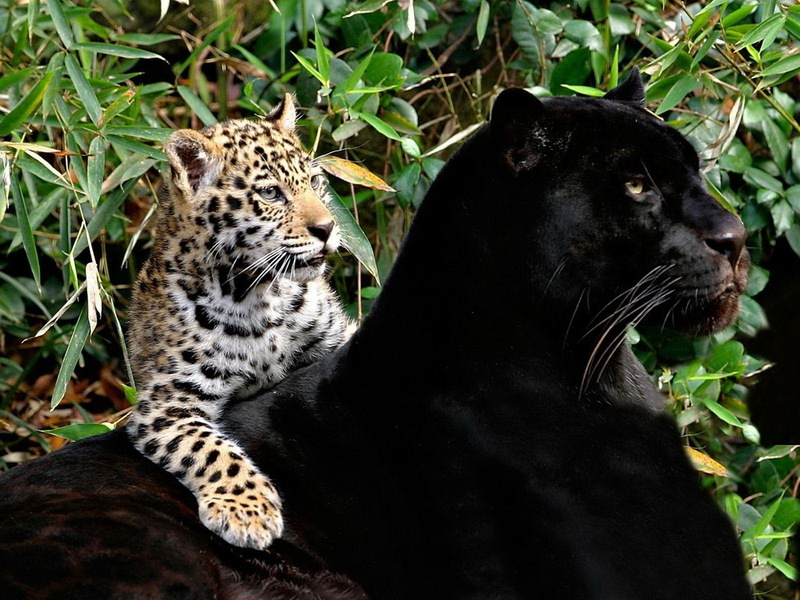 The Rare Species Fund was established to provide funding to critical on the ground international wildlife conservation programs, thereby complimenting the educational messages and field research of T.I.G.E.R.S. The Fund receives it financing base through a percentage of revenues taken in by T.I.G.E.R.S., the generosity of donations from exhibit guests, and the general public. The Rare Species Fund actively supports the African Association of Zoos and Aquaria (PAAZAB) in its efforts to improve African zoo collection management, captive animal husbandry, and public educational messages. On a Continent where millions of wildebeest make an annual migration of several hundred miles, covering a huge swath of two countries, accompanied by zebra and other plains game, as well as many rare and endangered predators, almost 99 per cent of all African youth will never see any of these animals in their natural habitat. The Rare Species Fund (RSF) is a non-profit grassroots organization that provides financial support and practical training to in-situ wildlife conservation initiatives. This direct-to-end-user approach places RSF among the world’s most effective conservation agencies. The RSF contributes to those efforts that have shown themselves to be the most viable in real world conservation of wild species populations. By putting essential money and equipment directly into the hands of people implementing the programs, RSF ensures the greatest value for every dollar spent. RSF also works closely with various state, federal and international agencies to help develop sound governmental policies pertaining to conserving and protecting the world’s wildlife. By assuring sustained funding for long-term research and conservation projects, RSF optimizes the prospects for preserving endangered species; for releasing excaptive animals into suitable, protected habitats; and for expanding awareness of the ties between humans and the natural world. The Rare Species Fund (RSF) was established in 1982 to provide financial support to on-site wildlife conservation projects and wildlife educational programs around the globe. 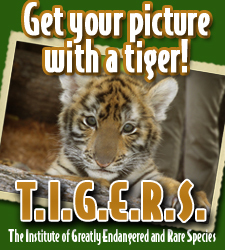 RSF derives its funding from The Institute for Greatly Endangered and Rare Species (T.I.G.E.R.S. ), and from underwriting by philanthropic agencies. Make plans to tour our 50-acre preserve in Myrtle Beach. For more information please visit, www.myrtlebeachsafari.com. The national ad campaign “Be Together, Not the Same” has gone viral for its humorous and touching video clips showing animals of different species playing and cuddling together. Four of the featured performers hail from right here on the Grand Strand at the T.I.G.E.R.S. Preservation Station and Myrtle Beach Safari. You can see this kind of inter-species behavior and more at T.I.G.E.R.S. Preservation Station and Wild Encounters Preserve. Located on the Intracoastal Waterway in the Socastee section of Myrtle Beach, this 50-acre property looks like a scene out of the African wilderness. The swampy Lowcountry terrain is home to a wide variety of wild animals, including apes, leopards, wolves and, of course, the namesake tigers. For more information or to book your safari, call 843-361-4552 or visit the website at www.myrtlebeachsafari.com. If you would like to share your T.I.G.E.R.S. experience, please send your story to smgusa@aol.com!